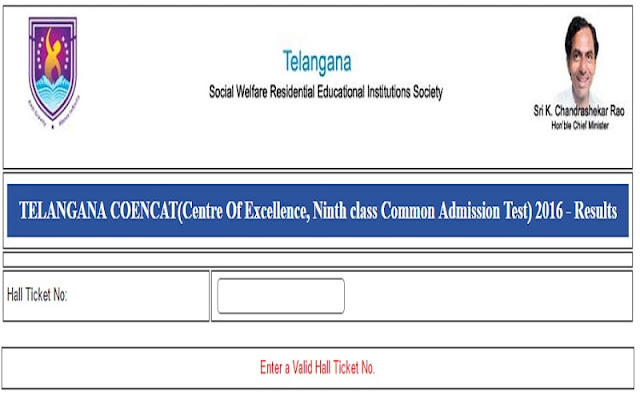 TSWREIS 9th Class Admission Test 2017 Results: COENCAT 2017 means Social Welfare Residential Schools Centre of Excellence Ninth class Common Admission Test-2017. TSWREIS issued the 9th class admission test notification in the month of February, 2017 for admissions into Social Welfare Residential 21st Century Schools in the TS for the academic year 2017-18. The Officials invited online applications from the eligible 8th class bonafide students during the academic year 2015-16 for admission into 9th class in its TSSWR Schools from 27/02/2017 to 27/03/2017. COENCAT-2017 exam was conducted on April 17th, 2017 by TSWREIS Officials in all districts head quarters.